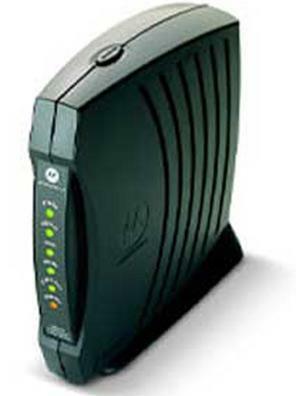 Motorola Surfboard and Ambit Cable Modem Help with information on l;ights and settings. Descriptions of two popular Cable modems, the Motorola Surfboard and the Ambit. Along with their light's functions , as well as other pertinent technical information. Motorola cable surfboard modems are fairly numerous and below you will find a picture how a typical model will look. Surfboards have a standby light and if set, will cause the modem to have no connectivity. (The stand-by button shuts down the front panel LEDs and disconnects communication between the cable modem and the devices connected through the cable modem, while remaining active on the cable operator's RF network.) The "important" light that indicates that the surfboard modem has connectivity with the cable provider is the Online light. It should be solid green. Receive If this light turns off during normal operation it would indicate the loss of the receive channel. Send If this light turns off during normal operation it would indicate the loss of the send channel. Online If this light turns off during normal operation it would indicate the loss of the IP registration. PC Activity This light will flash as the modem is transmitting or receiving data. Power If this light is not on then the modem is unplugged or is in Standby mode, in which case press the Standby button. For manuals or specific information about this and other Surfboard cable modems. Ambit cable modems can sometimes be referred to as the No-name modem, as finding the manufacturers name on the modem can be near impossible on some models. The best way to determine it is an Ambit modem is to read the lights left to right. The important light that indicates connectivity to the ISP is the Sync light, which should remain on (not flashing) if the modem is connected to the ISP. Important Note: Ambit cable modems seem to have an issue with releasing the MAC address registration from a previous device, preventing a new device from acquiring an IP address. This occurs even though a complete correct power cycle has been done. If this issue happens to you try waiting a longer period of time than usual with the modem unpowered (perhaps 8-10 minutes) ; another trick would be to disconnect the cable line at the same time the modem is unpowered. If this does not resolve the issue, then use the MAC Address Clone setting in the router and place the MAC address of the item that last gained Internet access (i.e. the computer). Power: Indicates that the cable modem has successfully completed internal power-on tests.